Indian Railway has multiple ways to lodge complaints related to amenities, security, food services or any other complaints/suggestions. As Indian rail are used by wide verities of users from a poor man in general class to business man in AC class, everyone may face one or another problem during the travel. Consider this aspect in mind railway have time to time created a different channel of complaints system for make rail journey stress-free. Trains can be local, passenger, Rajadhani, shatabadi, mail, express, superfast, any type of train and same complaints system applied for all. Complaints can be lodged for a station amenities or problem during running train. Every genuine complaint is tracked and monitored by Sr DSC of a division. Effectiveness – Very effective. I have spent few days in RPF Control room while testing of RISSTA Security app , I can say that every genuine complaint at 182 is seriously resolved, till customer problem is not resolved. Mechanism Simply calls then PNR no and share complaint details. In running train, sometimes it’s tough to have longer call to explain your problem, with PNR no, seat details, mobile no, problems etc. The toll-free number to complaint about any service issue provided by IRCTC, includes food quality, food pricing, bed rolls etc. RailMinIndia twitter handle is one best of use of twitter by Indian Railways, where complaints and lodge in the public domain and its resolution/response is also available in public domain. Mechanism Tag #RailMinIndia and provide PNR no, complaints details, mobile no for quicker response. Not a solution of the scalable complaint management system. Created a very ad-hoc system for 8000 crore travellers. Recently this number introduced by railways and response of this is pretty good. a very useful for non-smartphone users. Once a complaint was handle at multiple stations, till issue completely resolve, window repair in running train, repaired at multiple stations. Mechanism – Add 70939 92691 number to your contact list and start sending messages over WhatsApp. Effectiveness – Very effective for genuine complaints. Any security complaints are taken at highest importance and if image video also shared then security team handle them with more priority. A complete complaint system, introduced a couple of years back only, still not widely used. Not able to reached a popular as other as not so easy to lodge complaints. SMS complaints system managed and tracked by South Central Railways. Mechanism Your complaints details SMS to 8121281212. Expect some response of your complaints. Getting in legal/ FIR issue for travel means your in serious trouble. In case if you any good or bad experience of any of this complaint system please write us back at support@omitra.in so we can share your experience with other also and let make Indian Railways journey the best stress-free journey experience. Good news for you, that to get any of these complaints services, your don’t need to remember anything. Yes, Nothing. 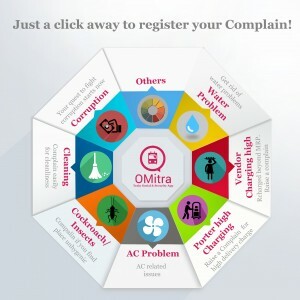 Just download OMitra App and every complaint system is available on single TAP and over come limitation of various system and easily pass PNR and other information . 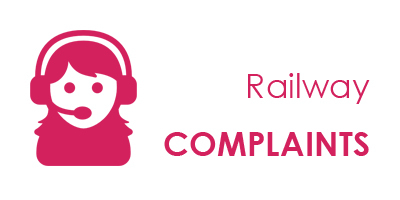 Request : If you are aware of any reliable, working railway complaint system, please suggest us and will add it here. Let’s we all make together Railway better. I registered my complaint of deactivation of my IRCTC account to COMS and care @indianrailways.in but of no help as till date satisfactory resolution has not been done. Guide me how to and whom to escalate? During travelling from Delhi To Ghazipur on Audihaar station, few people started pelting stone on running train and one stone struck on my uncle’s eye and pierced and damaged his eye. On audihaar station he started looking for help but no one came to fore to help from railway department. With the help of some fellow passengers he managed to reach to Ghazipur station but on Ghazipur station as well nobody came to help him. Somehow he managed to reach to a private doctor and from there he was referred to BHU and from BHU he was finally sent to AIIMS. Someone’s enjoyment took someone’s life(an eyes). Please help in this regard as he is a farmer and does not have enough funds to get the treatment.